Today’s route from Wrangell to Petersburg took us through beautiful Wrangell Narrows. Wrangell Narrows is one of the trickier parts of this trip. It’s winding, shallow, and….narrow. Traffic can be heavy, with little space for ferries and barges to pass boats like ours. Currents run swiftly. Fishing boats zoom erratically. In 20 nautical miles, the Coast Guard maintains about 60 aids to navigation. Just north of the mid-point, near a place called Papke’s Landing, the flood current converges. Run properly, you ride the dying flood in and the fresh ebb out, benefiting from 1-2 knots of current most of the way. Done wrong, you fight the current, burning excessive fuel and cursing your poor planning. 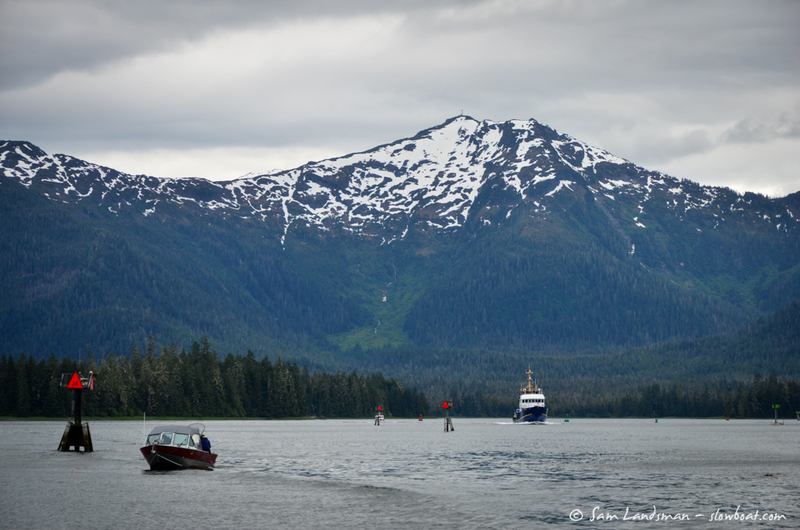 Wrangell to Papke’s Landing is about 30 nautical miles. At our normal cruise speed, this meant departing at 11:30 a.m. We enjoyed a lazy morning and headed out right on schedule. We hit the mid-point right on schedule and had the current in our favor almost the whole way. The lazy morning allowed us plenty of time to haul crab traps. We’d dropped them in the marina, right from the boat…and it worked! Six big male keepers (and the biggest one ever, we think, at about 8+ inches across). We had some fun yesterday after we arrived in Wrangell. A week or so ago, we ordered a pack of plastic lobsters (3 for $11) from Amazon, to be shipped to Frontier Shipping in Ketchikan. We picked them up, and the “waiting for the perfect opportunity” began. Once docked in Wrangell, our neighbor said he’d put crab traps out right from his bow and pulled up something like 8 big keeper Dungeness, so we threw a couple off of Airship’s bow and stern, and Dave and Bill on Orca Star threw one out off their port stern, and then headed over to the other dock for happy hour on Doll Face. We snuck into our dinghy, hiding behind Orca Star, pulled up their crab trap, quietly added a plastic lobster to it, and set it back down on the bottom. It was SO GREAT when they pulled up their crab trap later…did a bit of a double take, and then realized…”someone is messing with us!” Mwah hah hah hah. 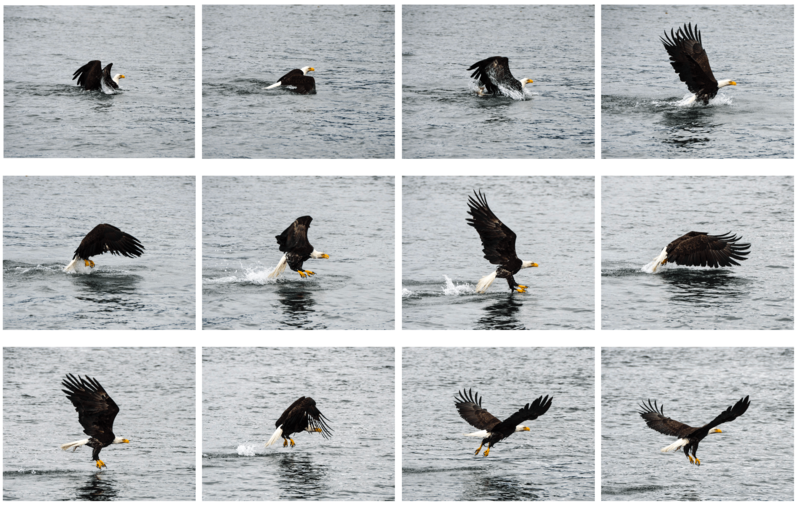 In the middle of Wrangell Channel, Sam spotted an eagle swimming. As Safe Harbour approached, the eagle thrashed frantically, trying to lift out of the water. Eventually it succeeded, but that look on the beak! We arrived into Petersburg around 5:00 p.m. and opted to do another potluck dinner…this time over on Akeeva (Nordhavn 50). Tonight’s feast consisted of yummy cod fish tacos courtesy of Carol on Akeeva, and a delicious jambalaya made by Dave and Bill on Orca Star (NT42). Tomorrow, we’ll take a day trip out to Le Conte Glacier and back. We’ll take two boats (Akeeva and Orca Star, as well as dinghies and kayaks for exploring) and if it’s not raining, we hope to get some good drone photos of both boats surrounded by ice. Fingers crossed!